The crux of most graduate programs is that they offer specialized or niche education in an academic field, in turn providing further mastery in a specific subject. A master’s degree in liberal arts then, seems to be a catch-22 of sorts. The liberal arts, by definition, are not subject-specific and instead emphasize the importance of knowledge in many subject areas, but that doesn’t negate the value of an MLA. Business // Though a master’s in liberal arts doesn’t provide traditional vocational training, it does emphasize the importance of critical thinking and intellectual curiosity. The implementation of these skills is critical to fostering creative solutions in the workplace. In the program, recent graduate Denise Dahlhoff says “my studies covered a variety of topics, including university governance, history of pop culture, urban folklore, life stories, public art, sociology in cities, and the impact of new media on our social interactions.” However in the end, her capstone project was on a potential advertising campaign to promote the benefits of the arts and culture, utilizing her past experiences in the business realm. Development // Sometimes there just aren’t specific graduate programs in certain fields. But luckily, that’s when an MLA can prove most valuable. Matt Pilecki, a 2015 graduate of Penn’s program, says, “Because of the MLA program, I am a better thinker, I am a better writer, and ultimately, I am a better worker. And most importantly, I am even more proud of what I’m doing.” Pilecki works in the Van Pelt-Dietrich Library Center in Developmental & External Affairs aiding fundraising efforts at the university. Education // At some institutions, a master’s degree is all one needs to gain the additional coursework necessary to become an educator. Whether you teach in a private school setting or go on to gain further teaching certification, your MLA will ensure that you’re versed in many subject areas and thus able to provide holistic lessons for your students. Government Employment // Take a cue from Plato. There’s value in taking a variety of classes ranging from philosophy to political science. And luckily, because a career in government is equally wide ranging, there are plenty of ways to implement your MLA based on your strengths and skills acquired from the program. Further Study // And, of course, the interdisciplinary emphasis of the liberal arts makes it an ideal stepping stone for further education. Dalhoff, who already earned a Ph.D. in marketing from the University of Jena in Germany, pursued an MLA and then went on to complete a Master of Philosophy in Liberal Arts at the University of Pennsylvania. Students in Penn’s MLA program complete an individualized capstone project that can then become a catalyst for future theses. 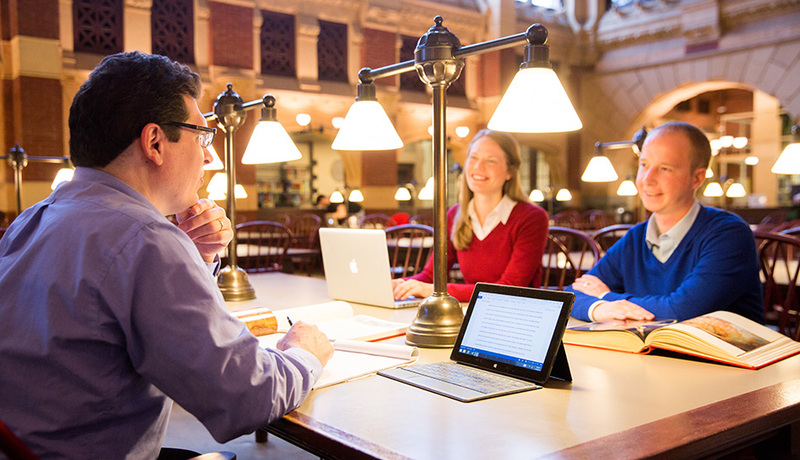 For more information about the University of Pennsylvania’s College of Liberal and Professional Studies Master of Liberal Arts program, attend a virtual information session hosted live and online from 12:30 to 1:30pm on November 2nd. Master of Liberal Arts Program Director Dr. Chris Pastore will discuss details about the MLA degree, and attendees will have the opportunity to ask questions and engage in conversation. Register here. Can Anyone Derail Philly's ExpressVoteXL Voting Machines Purchase?